Wright brothers, Orville and Wilbur invented “Airplane”. Orville and Wilbur Wright, known famously as the Wright Brothers, were American pioneers in the field of aviation and are recognized for inventing and building the world’s first successful airplane and making the first human flight in 1903. Wilbur (1867-1912) and Orville (1871-1948) were two of seven children born to Milton Wright and Susan Catherine Koerner. Neither of the brothers received high school diplomas; Orville dropped out of high school to start a printing business and Wilbur became socially withdrawn after an accident with a hockey stick which caused him the loss of his front teeth. Wilbur stayed at home to care for his mother who was suffering from tuberculosis. Wilbur did not attend Yale as he had initially planned. Wright brothers worked together in their printing business for a brief period, before joining in on the nation-wide bicycle craze. They opened up a sales and repair shop known as the Wright Cycle Exchange, later changed to Wright Cycle Company. They even began manufacturing their own brand of bicycles, but their main area of interest always remained aviation. This interest stemmed from their childhood, when their father bought them a toy helicopter based on an invention by a French aeronautical engineer named Alphonse Pénaud. The brothers were fascinated with it and played with it until it broke; after which they designed and built their own. They were also keenly interested in kites and used to build their own models. In the 1890s a German named Otto Lilienthal successfully managed a manual air glide, an event which fascinated both brothers. 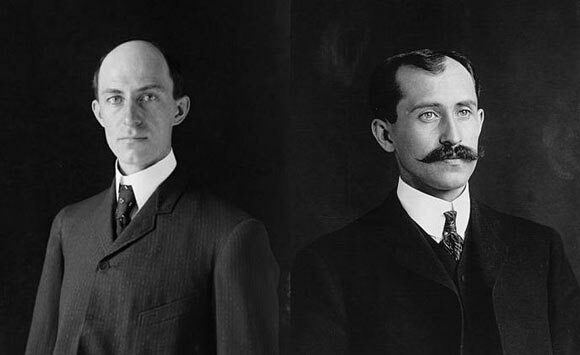 Although Lilienthal was subsequently killed in flight, the Wright Brothers were not discouraged. They felt that all that was needed to make a successful flight was practice. They felt that the wings and the engine were developed enough, and the missing factor was control. In this regard, they differed considerably from other aeronautical experts of the time who felt that a powerful engine was the key to a successful flight. The Wright Brothers observed birds in flight and mimicked the motion of their machine on the same pattern. In 1900, the brothers went to Kitty Hawk, North Carolina to begin their gliding experiments. They chose this location based on research about the wind and weather conditions there. The Wrights used the research conducted by other aviation pioneers to design and develop their glider. The design of their flying machine evolved over the years of their research. It has been noted that Wilbur did most of the flying as he wanted to protect his younger brother Orville from any harm. After years of experiments, amendments and research, the first successful, manned flight in history was made by Wilbur Wright on December 17th, 1903, witnessed by five people. The flight lasted only 12 seconds and covered 120 feet but it was a remarkable feet and the first of its kind in history. The brothers’ success became a worldwide phenomenon and they started taking passengers on board their flights. The world’s longest flight at the time lasted 2 hours and 19 minutes. The first fatal air crash took place in 1908 in a flight manned by Orville which he survived, but the passenger did not. In 1909, the US Government bought its first plane manufactured by the Wright Brothers for $25,000 with a bonus of $5,000 because the speed of the plane exceeded 40 mph. The Wright Brothers’ planes also became the world’s first military airplanes. Both brothers remained unmarried; Wilbur died at the age of 45 from typhoid and Orville of a heart attack at the age of 77. They remained friends and partners throughout their lives and never tried to discredit the other from the amazing and seemingly impossible feats that they accomplished together.